Last weekend I was fortunate enough to watch the amazing Glenn Miller Orchestra with my best friends for my birthday. 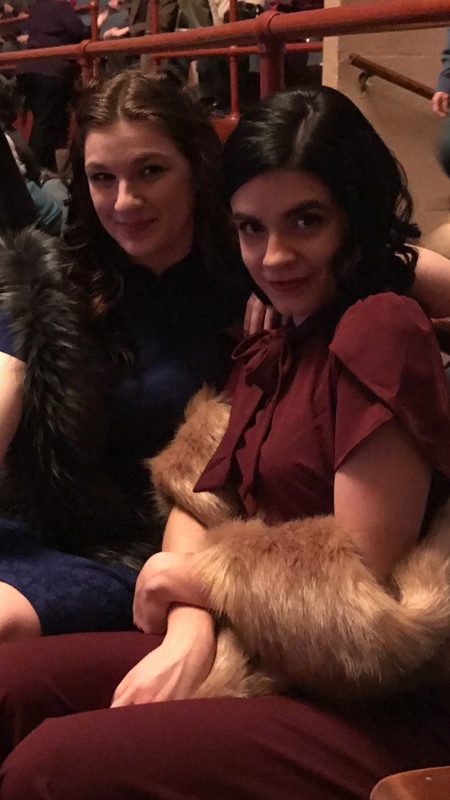 We got all dressed up to enjoy the music of the 1940′s and were easily the youngest members of the crowd. However, before we made it to the Carolina Theatre I received an early birthday surprise. This girl right here in the purple dress has been one of my very best friends for the past seven years and surprised me by flying across the country for my birthday. It has been an honor to watch her grow into the lovely young lady she is today and it was an honor witnessing her excitement at playing dress up for the orchestra. Now yes, it should be known that your value is certainly not rooted in how you dress, but how you dress can in fact make quite an impact. First though, take away all the crap that says women have to look a certain way, you have to wear this to be cool and accepted by your peers, and the unfortunate omnipresent judgement of others. With all that nonsense gone there is nothing left but to just have fun and play dress up. On this day, that is exactly what my best friend did. It’s not everyday that she gets to waltz around in a beautiful vintage dress and it was clear that she was loving it. She was glowing all night. Her elegance wasn’t simply derived from her dress, but how her dress made her feel. There is power in playing dress up, in having the confidence to put something fun on and just own it. Though, it should be noted that if your idea of something fun includes sweats and footie pajamas in the place of a dress then, enjoy! It doesn’t matter what it is exactly that you put on as long as you’re having a great time in it. And yes I personally think my best friend is constantly a beautiful individual, inside and out, but watching her walk around the theatre owning the place and owning herself was a treat. I love you, Lauren and watching you play dress up and simply grow up is a privilege.